FAMILY SECRETS. PARALLEL WORLDS. FORBIDDEN LOVE. Eighteen-year-old Alexa Moore has had enough of her rigid, controlled existence. Shortly after her graduation, she decides it’s time for her to make the decisions in her life, and quit letting her grandmother have the last say. But when she sees a man watching her—at her graduation, at the market, outside of where she volunteers—her excitement is snuffed out by a sense of dread she can’t shake. And that’s only the beginning… Soon, strange things begin happening: doors opening by themselves, books falling off shelves. At first, Alexa ignores the bizarre occurrences, chalking them up to coincidence. But when things take a violent turn, she discovers that these occurrences aren’t coincidence at all. In fact, they’re all tied to one thing: her. It isn’t long before she realizes that telepathy and empathy are not the only abilities she possesses. And these new abilities—ones she cannot begin to explain—are growing in strength…becoming more and more dangerous. Lost and confused, Alexa turns to her grandmother, the one person she trusts above all others, for help. But Gran isn’t who she appears to be, and Alexa finds herself embroiled in a family history that’s shrouded in mystery and lies, where no one, not even the young Irishman she’s fallen for, is who they seem. 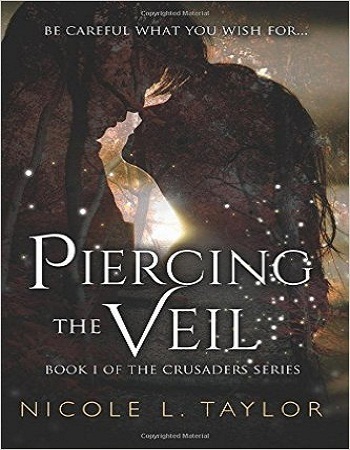 Part romance, part thriller, and part fantasy, Piercing the Veil is Nicole L. Taylor’s premiere novel that is not to be missed.